1985: ”Hello, Mars Talent, this is Wendy Kay”. They ring from early morning to the wee hours of the night — including weekends. The days are long and can be stressful, but Wendy enjoys the work. After graduating from Oneonta State (New York) in 1981 with a degree in Psychology, she accepted a job with the State of New York Department Of Corrections, in Albany, NY. She then moved into the juvenile delinquent system as a counselor until 1983. Wendy’s next position was sales representative for the Hoover Company in Connecticut, where she worked until 1985. That year proved to be the turning point in her life. Arnie had his first heart attack, and Wendy came home to help with the family business. Arnie started Mars Talent Agency in 1972. His specialty was booking ’50s and ’60s acts, and eventually became the exclusive agent for many of them. Wendy’s first year at Mars Talent was tough. Besides worrying about her father, she came into the business cold, and had to learn things very quickly. As the year passed, Wendy became more adept at handling the business. With the support of her mom, Rosalie, and the constant encouragement of Arnie, she gained the trust of the acts, promoters and other agents. With the return of the “nostalgia era,” Mars Talent acts and business kept expanding. Wendy continued to grow with the business. By the time Arnie had his second heart attack in 1991, Wendy was responsible for the day-to-day operations of Mars Talent. 1993 was a very sad year for Mars Talent, its clientele, and the music business. Arnie had his last heart attack, and passed away at the age of 59. He left behind his wife, Rosalie, Wendy, his son Steven, and his daughter Cindy. In 2019, Wendy will be celebrating 34 years in the entertainment business. Wendy’s father, Arnie Kay, founded Mars Talent Agency in 1972. His specialty was booking 50’s and 60’s artists. In 1985, Wendy joined the family business— and never left. In 2006, Wendy joined forces with the principles of Paradise Artists and was inspired to form their sister company, Utopia Artists. In 2010, Paradise and Utopia amicably went their separate ways and Wendy forged ahead with Utopia Artists, LLC. 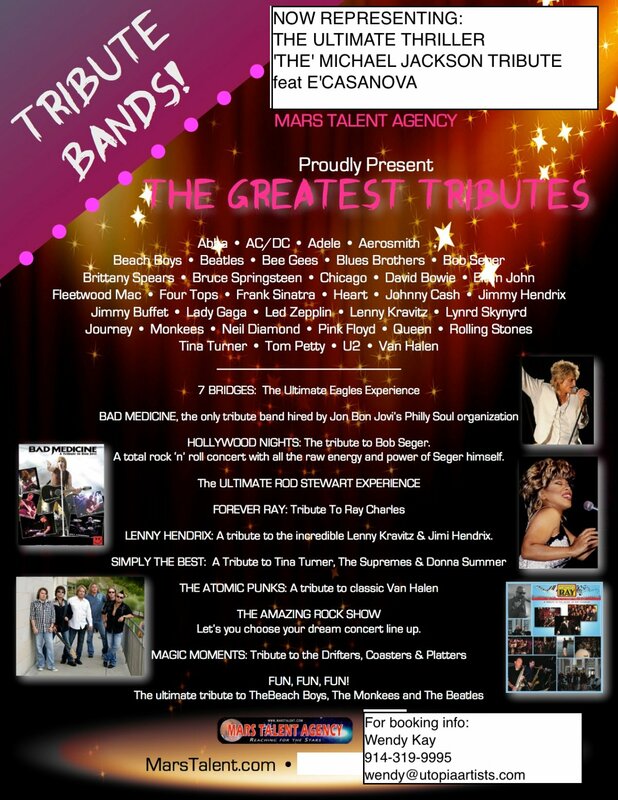 UTOPIA ARTISTS/MARS TALENT AGENCY has been a leader in the talent buying industry for the last 34 years. We have produced corporate shows, fundraising events, and worked with Fairs and Festivals, Performing Arts Centers, Casinos and Private Events. We have booked major concerts with such luminaries as: MICHAEL JACKSON, NELLY, THE BEACH BOYS, LEANN RIMES, CLINT BLACK, KC & THE SUNSHINE BAND and so many more. OUR outstanding reputation among clients and our network of agencies, artists, and management gives us the best buying power to allow us to provide the most current information, including pricing, availability(routing specials), and more for any artist of interest. We work for you to select talent specific to your venue/event and budget. With Mars Talent Agency, Utopia Artists, Dream Night Talent Search and now WENDEE, Wendy is very busy and excited about what is still yet to come.